Synopsis: With public anticipation running high, Apple Inc. co-founders Steve Jobs (Michael Fassbender) and Steve “Woz” Wozniak get ready to unveil the first Macintosh in 1984. Jobs must also deal with personal issues related to ex-girlfriend Chrisann Brennan and their young daughter Lisa. Eventually fired, Jobs launches NeXT Inc. and prepares to release a new computer model in 1988. Ten years later, Jobs is back at Apple Inc. and about to revolutionize the industry once again with the iMac. Most know Steve Jobs as the mythic, silver-haired, bespectacled figure in the black turtleneck, who is best known for introducing the world to the Mac, iPod, and iPhone. However, few know the man behind the turtleneck; the brutal businessman, the impersonal inventor, and the selfish father who is synonymous with Apple. 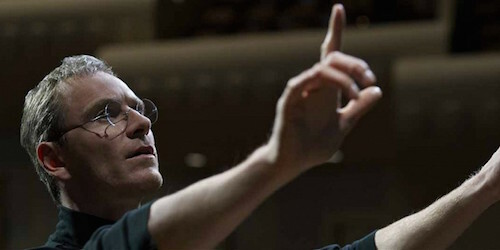 Danny Boyle’s biopic Steve Jobs hopes to shed more light on that second figure, and does so with the help of a sharp script by Aaron Sorkin and a bold performance by Michael Fassbender. The film may have flaws, but as a unique look at one of the tech industry’s biggest giants, Steve Jobs is one of a kind. To say that Steve Jobs is anything but traditional works both to describe the man and the film. Rather than give viewers a beat-by-beat, bullet point recap of Jobs’ life, the film picks up with the Apple founder at three key points in his life. With the launch of three major product launches looming just minutes away, Jobs reconnects with many of the most important figures in his professional and personal lives. 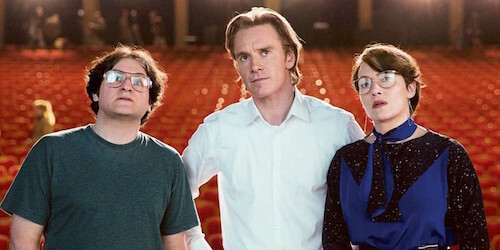 His close confidant and Marketing head Joanna Hoffman (Kate Winslet), fellow co-founder Steve Wozniak (Seth Rogen), head engineer Andy Hertzfeld (Michael Stuhlbarg), and Apple CEO John Sculley (Jeff Daniels) all flow in and out of the scenes with minimal contrivances, as only Sorkin characters could. And make no mistake, the individuals in Steve Jobs may be based on real people, but they are as much characters as in any other fictional narrative. Sure, Steve Jobs wants to highlight the man and not the myth, but the script takes many historical liberties to make its point. Most especially, Steve Jobs using Jobs’ real-life daughter Lisa as a type of secondary framing device for the man’s development. At first, Jobs fails to acknowledge his paternal role, but eventually comes to understand and eventually welcome it. So while Jobs’ professional career is charting one trajectory, his relationship with Lisa is on another. It’s a smart choice on Sorkin’s part to frame the film this way, as it serves to give Jobs some humanity, but it also feels like a gimmick in some respects. In fact, most sources agree that Lisa’s involvement in the three major product launches of the film was minimal – i.e. she likely wasn’t in attendance. Apart from that, though, Steve Jobs is a unique biopic with a clear vision. Aaron Sorkin’s script, Danny Boyle’s direction, and Michael Fassbender’s performance all meld together into a dialogue-driven biopic that has more momentum than some of the biggest blockbusters around. The writing, as expected, is sharp, every cast member breathes life into their role well, and though he doesn’t put much style into the picture, Boyle lets the key pieces do the talking. What fault there might be in the way Steve Jobs takes liberties with real life, it more than makes up for in being a compelling depiction of the Apple co-founder as a fatally flawed human being. It’s a biopic that pulls no punches, and because of that, is a knockout. If nothing else, Aaron Sorkin’s Steve Jobs script has a clear pace and a unique concept. Choosing to frame a look at Jobs’ life around three product launches is not only smart, but it also keeps the film focused and razor sharp. Along with that, Sorkin adds his rat-a-tat dialogue and penchant for naturalistic delivery. He knows how people interact with each other, no matter how godlike they may be, and here he even reigns things in a bit. Jobs may have the same clout as Mark Zuckerberg, but this is not Sorkin repeating himself. The only fault in the script is that the redemptive arcs lack a little of the necessary punch; that is, when it comes time for the heartfelt moments, the film doesn’t resonate quite as strongly. Small gripes aside, Sorkin’s Steve Jobs script is up there with his previous work, and in some ways surpasses it. Michael Fassbender may not win any awards for his performance as Steve Jobs, but there’s no doubt he does a tremendous job at bringing him to the big screen. Most importantly, he brings a cold calculated demeanor to the role, ensuring that viewers understand Jobs was more than just a smiling face. His gravitas does err a bit too much on the intense side and a little less on the emotionally grounded, but that’s not necessarily Fassbender’s fault. Some of the script work and the direction are to blame there, too. Alongside Fassbender, Steve Jobs boasts a cast of familiar faces and strong character actors all at the height of their game. Kate Winslet is excellent as Joanna Hoffman, the true emotional center of the film, but has a slight problem keeping Hoffman’s Polish accent consistent. Daniels, Stuhlbarg, and Rogen are also putting in standout work, playing off Fassbender’s cruelty. For a script this challenging, it’s a testament to the cast’s talent that they don’t seem completely flustered.